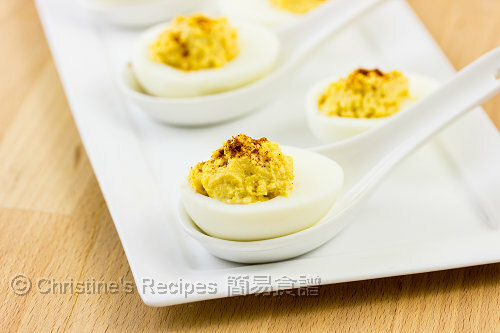 These deviled eggs are very delicious and well-liked at any parties, perfectly served as finger food. The whites are not chewy but soft and smooth, with well-seasoned yolks on top. I can understand why we have eggs during Easter. Eggs symbolize life, making sense to me in relation to the meaning of Easter. Yet I have no idea why these stuffed eggs are called deviled eggs. Needless to say, google is a great place to find out the answer. To my surprise, “devil” is a culinary term, first known print reference appearing in 1786, referring to some hot and spicy dishes. Oh well, got it. Nowadays, the term “deviled” is often loosely used to describe foods that are oily, chocolatey or with high-carb or high-sugar contents. Speaking back to these stuffed eggs, they are not evil at all as far as we’re concerned about the nutritious facts of eggs. 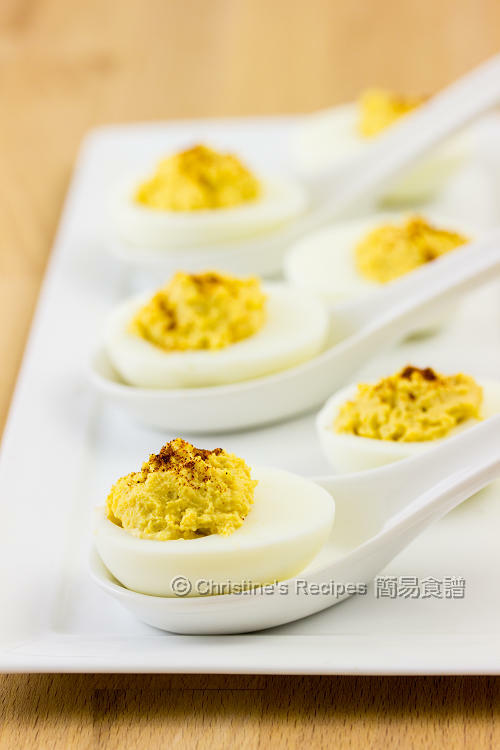 Besides, these deviled eggs are very delicious and well-liked at any parties, perfectly served as finger food. The whites are not chewy but soft and smooth, given that you know how to make perfect hard-boiled eggs, with well-seasoned yolks on top. This fresh-looking dish is simple yet heavenly tasty. May I call them angeled eggs instead? Carefully place the eggs in a large pot of water. The water should cover all the eggs. Add vinegar and salt, 1 teaspoon each. Turn on the stove. Bring it to boil over high heat. Cover and reduce heat to low. Continue to cook for 10 minutes. Drain up the eggs and immediately transfer them into a large bowl of cold water until cold to touch. When the eggs turn cold. Crack the egg shells and peel. Carefully cut eggs in half lengthwise. Spoon out the yolks into a mixing bowl. Mash them with a fork. Mix in mayonnaise and Dijon mustard. Season with salt and pepper. Spoon the yolk mixture back into the egg whites. Sprinkle smoked paprika on top. Enjoy! By adding vinegar and salt in water when boiling eggs, it helps prevent the egg whites from leaking out if the shells crack during cooking. 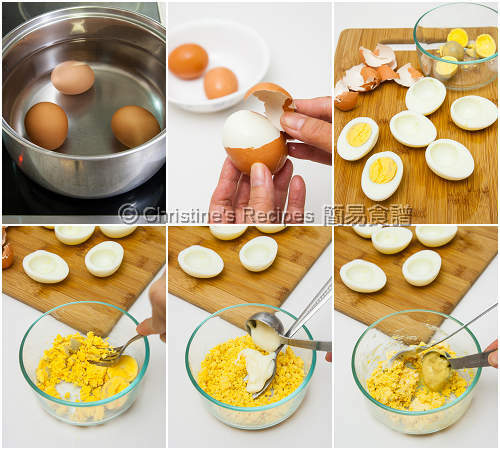 For making hard-boiled eggs, Elise's How To Make Perfect Hard Boiled Eggs has many good tips that you don't want to miss. I don’t mind if the yolks are centered or not. If you’re really keen to get centered yolks, gently stir the water continuously with chopsticks during cooking then. But this method won't work for cooking a large number of eggs in a small saucepan as there is not enough room for the eggs swirling. As a result, the shells would easily crack. After soaking the boiled eggs in enough cold water until they are completely cold, the egg shells can be easily peeled off without any problem. My favorite recipe. My mother use to make those especially in Christmas time. Smoked paprika and taste I guess it was for cold winter days. Love it! We love a hint of smoked paprika on top too. Make a difference. Thanks for dropping by. I love deviled eggs too. These look scrumptious, Christine. Love the presentation on the spoons. Great touch.